I had my reservations about consuming raw fish in landlocked Tulsa, Oklahoma – but, after taking a big sniff, the fishmonger assured me the mahi-mahi was fresh. What a flavor sensation it is – mild fish swimming in a blast of tart lime juice and cloaked in creamy coconut milk. I added a bit of hot pepper to give even more dimension, but you can use regular green peppers if you’d prefer. TIP: Ask your fishmonger to skin the fish and remove its bloodline. TIP 2: If you have leftover coconut milk from a can, use it to make some Grilled Corn with Coconut Milk. Make this recipe beachside, preferably with dried ocean water on your face and sand in your hair. 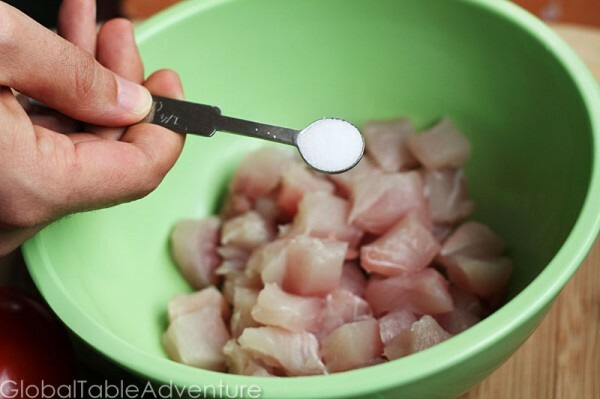 Then, dice the mahi mahi as small as possible. I did 1/2 inch cubes, but 1/4 inch is preferable. And the juice of two limes. Give the fish a thorough stir. Lime juice can only “cook” the fish it touches. Cover and marinate for an hour in the fridge, tossing mixture with a spoon after 30 minutes. Look – the fish is now white! The acidic limes did their work… chemically “searing” the outside of the fish. 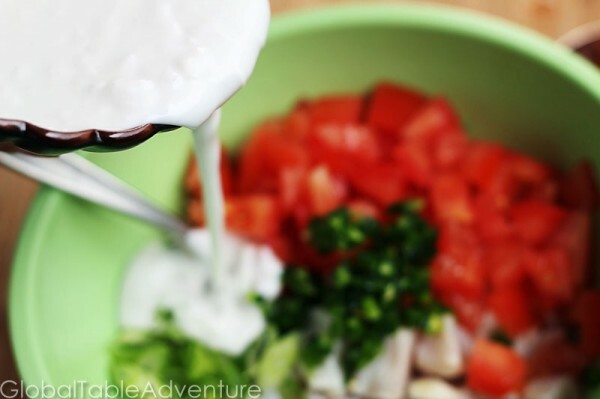 And pour on the coconut milk (whisk the coconut milk smooth before adding to the fish). Give everything a stir and serve with pieces of lettuce. You can leave it soupy (I’ve seen photos this way) or use a slotted spoon to drain off some of the liquid. Whatever works for you! I kept mine rather dry and scooped the kokoda up with lettuce, rather like chips and salsa. Serve after a game of beach volleyball, or a long, tiring swim. Oh, hurry up summer! I’m ready. 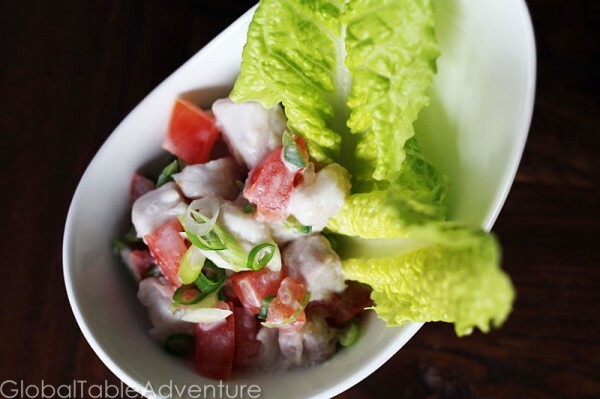 Until Kokada entered my life, ceviche was uncharted territory for me. Raw fish dishes are definitely not native to my hometowns – Boston, Atlanta, Paris, or Luxembourg – they’re really more of a tropical item. (Is it weird to say I have more than one hometown? It’s all I know…) I had my reservations about consuming raw fish in landlocked Tulsa, Oklahoma – but, after taking a big sniff, the fishmonger assured me the mahi-mahi was fresh. What a flavor sensation it is – mild fish swimming in a blast of tart lime juice and cloaked in creamy coconut milk. I added a bit of hot pepper to give even more dimension, but you can use regular green peppers if you’d prefer.TIP: Ask your fishmonger to skin the fish and remove its bloodline.TIP 2: If you have leftover coconut milk from a can, use it to make some Grilled Corn with Coconut Milk. 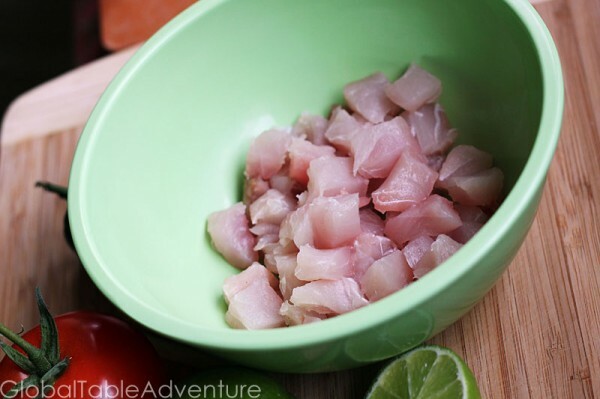 dice the mahi mahi as small as possible. I did 1/2 inch cubes, but 1/4 inch is preferable.Sprinkle with salt…And the juice of two limes. Give the fish a thorough stir. Lime juice can only “cook” the fish it touches. Cover and marinate for an hour in the fridge, tossing mixture with a spoon after 30 minutes. 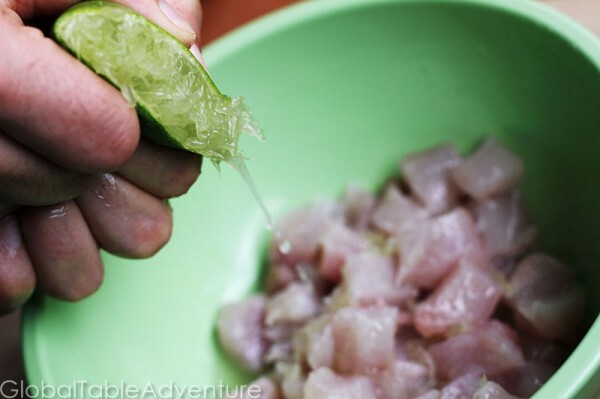 The acidic limes do their work… chemically “searing” the outside of the fish. 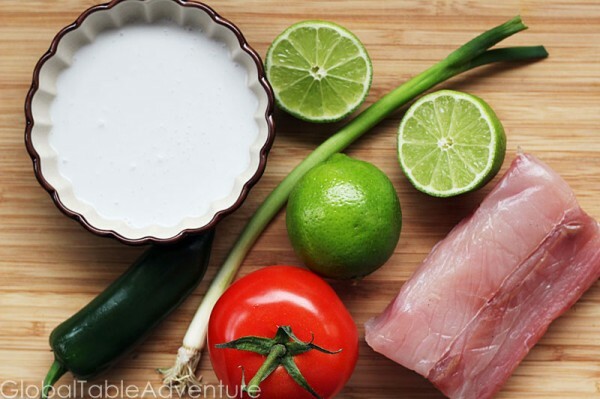 Toss the tomatoes, green onion and jalepeno on top of the fish…And pour on the coconut milk (whisk the coconut milk smooth before adding to the fish). 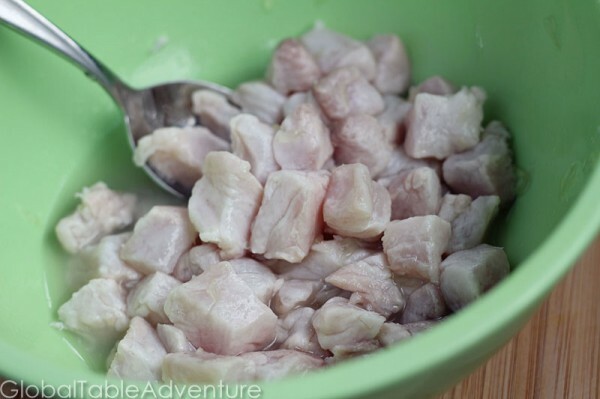 Is the fish in ceviche really cooked? as in… if i’m pregnant can i eat this or do i need to wait a few more months? Oh, no- for this dish you need to wait a few more months – the fish at the center is still raw. Just the outside is chemically “seared” by the acid in the lime juice. I suppose if you cut the fish small enough it could cook all the way through… but it would have to be teeny tiny pieces. I saw in Mark Bittman’s book “The Best Recipe in the World” that you can take the chopped fish and quickly drop it into simmering water – in just a few minutes you could cook it all the way through. Then you can toss it with the rest of the ingredients. 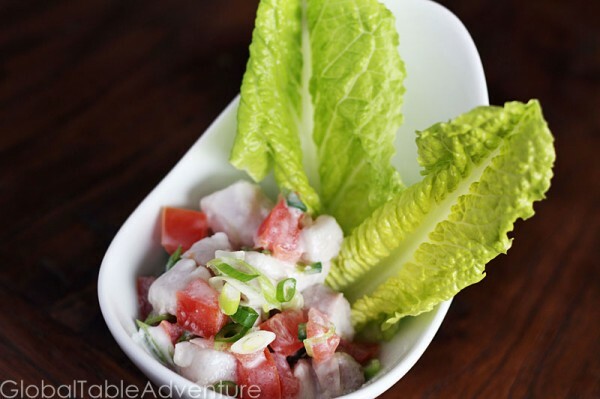 This would make the dish safe to eat for you, although the flavor and texture would be different – it’s a mock ceviche. Perhaps you could try this? It’s what I did for Ava’s portion – so she could try it (but all that tart lime juice was not her thing). Congratulations by the way! Wishing you a happy pregnancy and beyond! Thanks! for the congrats and the advice! It’ll probably be best to wait. 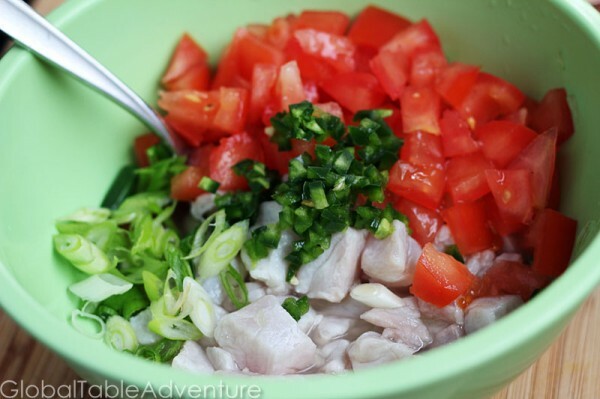 I’ve been wanting to try ceviche but it’ll probably to try it when it’s best! Summer, summer, where are thou? Anyway today it felt like the first day of spring, at least, here in Germany. Yay! I’m very suspicious of raw fish in this place, but I need to try this. Just ultra super fresh fish will do for me, but otherwise, i love raw fish. Lived in Tonga for a year as a teenager and it probably took me 3 months to work up the courage to taste the local variety (Ita Oka). What wasted months! I returned regularly for business from 2000 thru 2010 and made sure to search this dish out, along with the roast suckling pig and Tongan yams. My other favourite was Lu Pulu (corned beef, coconut cream and onion, wrapped in taro leaves and cooked in an earth oven. All served up with a heavy dose of local good humour and warmth. Previous PostFiji teaches: what food would be on your flag?